Pembroke Welsh Corgis originally served as all-around farm dogs, helping with all the farm tasks including moving the family’s livestock. Most corgis today are not fortunate enough to have their own stock at home, but many get the opportunity to show they still have herding instinct by participating in instinct tests or herding tests and trials. 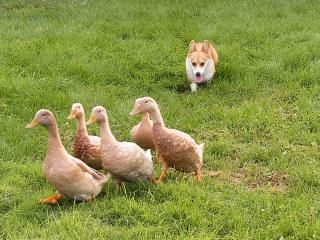 Herding Instinct tests are usually offered on sheep or goats, although occasionally may be offered on ducks. Herding tests and trials offer titles on sheep (including goats) or ducks (including geese) or cattle. 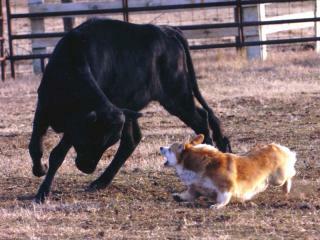 Corgis can be very effective cattle dogs, where their tenacity and ‘pushiness’ are an asset. The corgi’s short stature and correct structure allows him to duck under the cow’s kick, while taller or slower dogs often suffer from those kicks. The PWCCA sponsors Instinct Test Certificates that are offered at many of the Regional Club’s annual Instinct Test fun days. This is often a corgi’s first exposure to livestock, where an experienced herding judge will handle the dog to see how he/she reacts to stock. 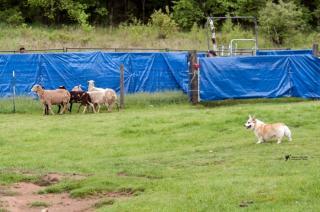 Some dogs may need more than one exposure to ‘turn on’ to working stock, so owners should not give up on herding with a pup who doesn’t pass the first time. Dogs who do have instinct and really turn on to stock sometimes go on to pursue test and trial level work in three organizations – AKC (American Kennel Club), AHBA (American Herding Breed Association) or ASCA (Australian Shepherd Club of America). Corgis have achieved Championship titles in all three herding organizations, although most admit herding is the most difficult sport to get Championships in just because there are fewer trials offered and it is expensive to keep stock or travel to a trainer’s facility for lessons and practice. The corgis love doing the job they were originally bred for, so those who get bit by the herding bug make the sacrifices to let their dogs show what they can do on stock.